DisplayPoints: What makes DisplayPoints so effective? DisplayPoints offers a dramatic improvement on the traditional table tent and guest merchandising tools. Restaurants, bars and advertisers can change or customize ads and promotions at a moment's notice. Even better, different content can be deployed at different times of the day as customer demographics change from breakfast, to lunch, to happy hour and dinner. Like a traditional table tent, DisplayPoints is placed right on the table for maximum attention and interaction while remaining inconspicuous. 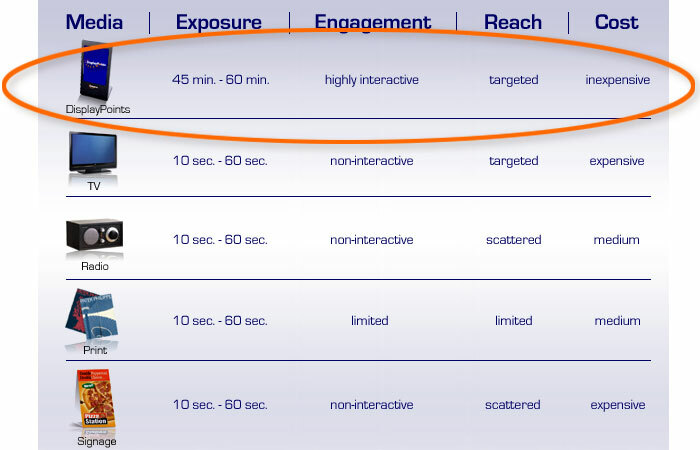 Compare DisplayPoints to other forms of advertising - there is no comparison!